By Asgard, it’s the Thor movie review! 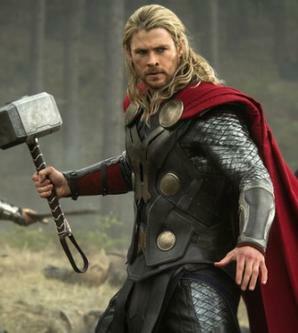 I saw Thor on the long Labour Day weekend and thought it was a decent film. My more geeky friends were calling it horrible and panning it as though it was another edition of Scary Movie. If you were expecting another “Iron Man” or “Batman Begins” you will be disappointed but if you want a fun superhero film, then this fits the bill. As a writer and mythology buff, I was worried about how Thor would turn out. I’d also grown up reading Marvel’s Thor comics as well as watching the animated series and understood that this would be a very hard property to bring to the screen. Thor, in Marvel’s mythos, is the son of Odin, king of the realm of Asgard which is pretty much Godville – populated by a breed of superhuman or gods, if you like. With his mighty hammer Mjolnir, he defeats evildoers while still having time to make googly-eyes at his mortal love Jane Foster. Despite my friend Calvin’s disappointment with the film, I think Thor has some brilliant acting, a bar higher than most superhero flicks so far. Anthony Hopkin’s portrayal of Odin for instance could easily have become melodramatic or high camp but he bears himself with a suitable gravity. There’s a genuineness to the actors’ portrayals in Thor that is missing from films like the recent Iron Man sequel and the latest X-Men installment. While I believe the script could have been stronger, as far as the direction goes I hope Brannagh returns for the sequel. The CGI is also perhaps the best I’ve seen this year but it doesn’t overwhelm the film. I give the film a solid 7.5 of 10. Good fun, stellar acting and very entertaining. Next Post → The Chinese chauvinist agenda or…WTF?